Thanks to Hexameter, there's now an alternate version of the carousel with beautiful music! This is in "echo-carousel-withsound" which will overwrite the original "echo-carousel". You should only have one of these in your game at a time, you can choose which you would prefer. If you want sound, you must download "hexameter_Carousel-sound.zip" from this thread. Minor Update - 13 Jan '07: If you downloaded the bumper cars for the first time since the update on the 7th (below) you may need to download them again as I forgot to include a required file in the .zip. Sorry! Update - 7 Jan '07: Hi all, just a quick update to a few of the files. - The clowns, spooky cart and bumper cars have had their advertising increased to the same ranges as the swing set. This *may* make your sims more inclined to use them autonomously, although I won't guarantee it. The roller coaster and the carousel have not been modified, for technical reasons. - I've added poly counts to the text below. Thanks for all the wonderful feedback everyone has left me, and I hope you continue to enjoy! 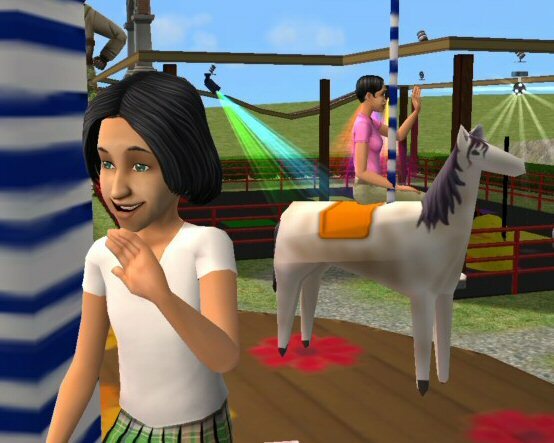 It was over nine months in the making, but it's finally done... Now it's time for your Sims to visit the carnival! This set contains working rides and entertainers to make your own carnival, fair ground or theme park. Everything from roller coasters to performing clowns. Most of these items are designed to let you construct your own rides if you have a bit of build-mode know-how. You can make your own rollercoaster track, or build and set up a new haunted house. Some of the rides are straight drop-and-play though, so you don't need to be a great builder to use those ones in your community lots. These two clowns juggle, dance, and generally make a fool of themselves for the enjoyment of their Sim audiences. Watching them raises fun, and causes a lot of laugher! Note: The clown podiums can only be moved while there are no clowns on them. Once a clown has been spawned, you will need to use Moveobjects on to move or delete the podiums. 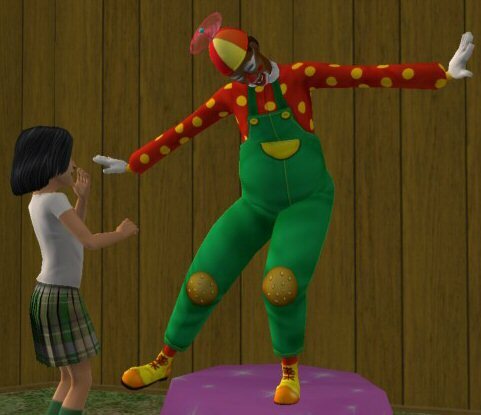 Minor Update: For some reason, the clowns were not showing up on community lots in some games. If this is affecting you, please re-download clown_female.zip and clown_male.zip. This should force the clowns to appear. Alternatively, re-buying the clown podiums has been reported to fix the problem as well. Thanks to fanseelamb and CynicalChick for finding this one. Poly count: 30 faces (podium). 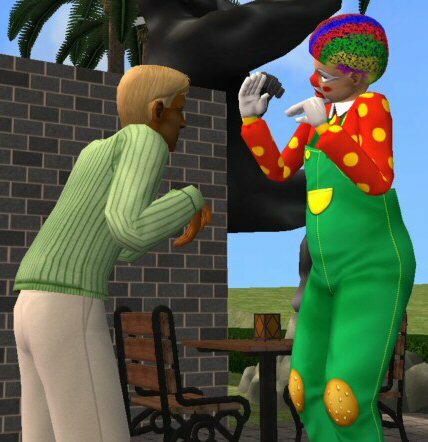 The clown is an NPC, and so has the equivalent poly count of most sims (ie - quite high). For the more passive carnival goers, the carousel provides a calm, relaxing opportunity to sit and watch the world go by. 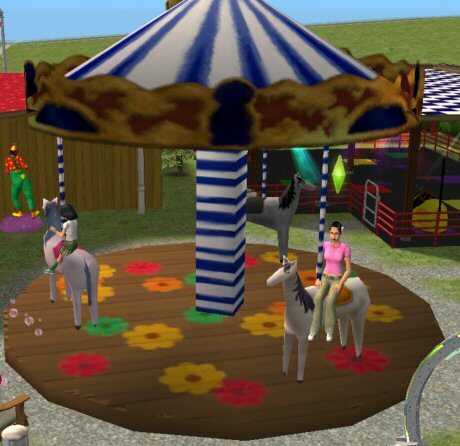 The carousel can hold three sims at any time, and will spin slowly and continuously except when sims are getting on or off. 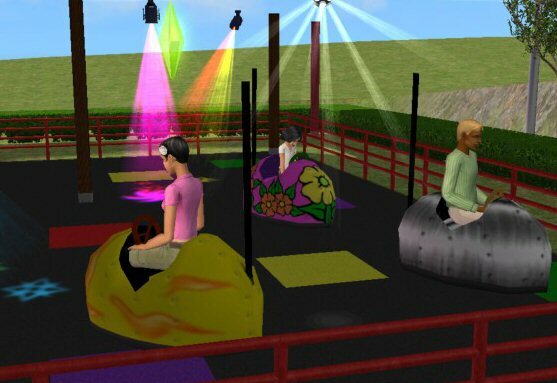 A fun and social activity, these carts let sims drive around a bumper car rink, and even drive into each other! They're a bit noisy, but a great activity for groups. 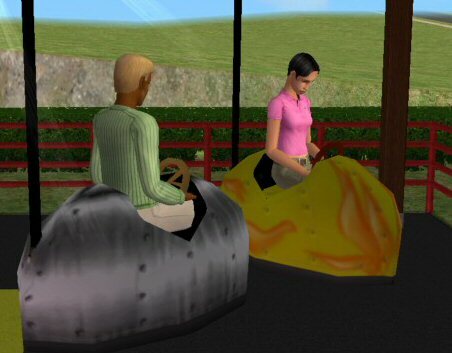 Bumper cars can only be used on community lots. What sort of carnival doesn't come with a roller coaster, and this is certainly one for the thrill seekers! Each roller coaster can hold two sims. 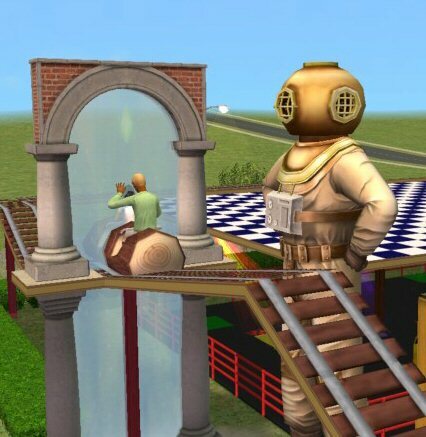 Builders can design their own tracks for the roller coaster to drive around, and sims will squeal with delight (or terror) as they zoom along. 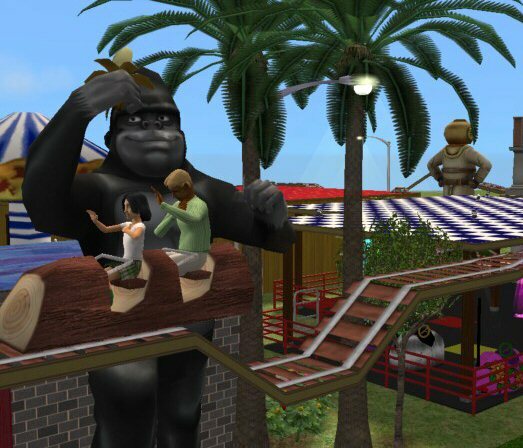 Roller coasters can only be used on community lots. All sims like to be scared once in a while, and for them a haunted house is great fun! This cart runs a little slower than the roller coaster and only holds one sim, which just makes it all the creepier. Sims will get really spooked in this cart, but will still have a lot of fun. Spooky carts can only be used on community lots. These segments of transparent flooring can be used to build your own rollercoaster track up in the air. There is one straight segment and one corner segment - you'll need pets installed to rotate these floor tiles in all directions though. This pdf document is intended for builders who want to create their own roller coasters. It is heavily illustrated, and shows how and where to use the necessary building cheats, and how to make the carts go where you want them to. These make a great prop for your haunted houses. These skeletons have all the best dance moves, yet still manage to look completely eerie! Poly Count: These are in-game maxis skeleton meshes. (I don't have the exact count). They are designed for the Sims, but are still high poly. This could look good in any natural wonderland, but it's much more fun when you have to go right through it on a rollercoaster ride! A two tile, two storey waterfall. 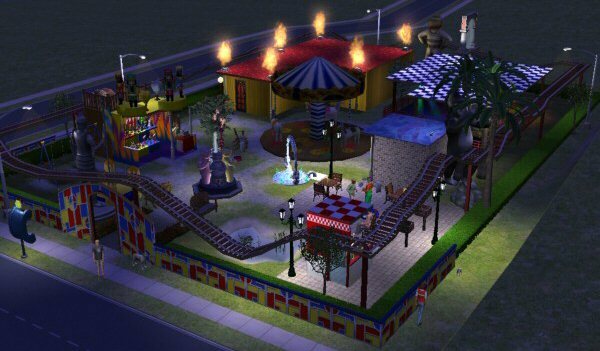 To save you the time and hassle of actually building a carnival with all of these items, here's a complete carnival community lot so your sims can enjoy it straight away. 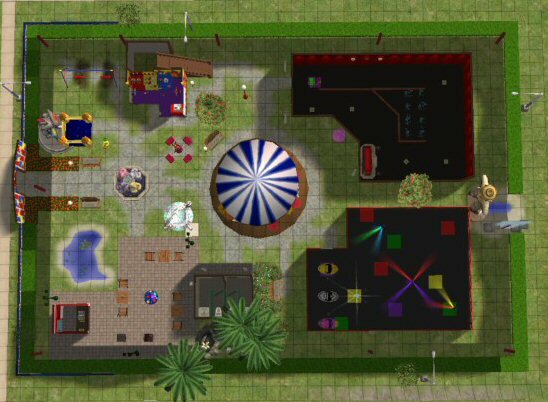 The lot uses all of the items in this thread, as well as one of my previous creations, the jumping castle. Only the castle is included in the lot file, you must also have all the other downloads included in this post. This is a medium sized lot (3x4). This set has been built and tested with all EPs up to and including pets installed. Some objects may only require one or two of the EPs, but in the interests of simplicity I assume that everyone playing with them has all EPs. Stuff packs are optional. If you want to try using these objects with one or more EPs missing you are quite welcome to (and they may well work), but you do so entirely at your own risk. Also, some of these items have very substantial code modifications. This set is easily the most complicated thing I have created to date. Consequently, there is a good chance that things may occasionally behave oddly or unexpectedly. If this happens, feel free to post here or to PM me with a detailed explanation of what went wrong, and if possible, a copy of the error log. Consider this set "in testing" until otherwise stated, and if you are the cautious sort you may want to wait a week before installing so that any big bugs can be identified and fixed. Getting on and off some of the rides, some of the animations are not quite right. The sim may try to board from the wrong direction, or may slide from one location to another during the movement. This is a known issue, and is not likely to get fixed. As with all my custom content, you're allowed to recolour, remesh, or recode to your hearts content. I'd love to see what you make! Attribution (credit) for derivatives is appreciated. - Delphy, all the mods, and the other regulars at MTS2 who made it the great place that it is. You all rock. That's it folks, download, enjoy, and happy new year!